Not to overwhelm you with quinoa, but I can’t help myself right now. This is very much a blueprint recipe and hopefully it’ll provide some ideas in terms of giving your old grain-based salads new tricks. My inspiration today, clearly, is spring: I want grill marks, I want tart and snappy textures, a zesty vinaigrette, and most of all, I want green. Grilled romaine seemed to be all the rage a few years ago. I didn’t take to it then, but recently, when I sampled a friend’s risotto that had wilted romaine in it, I immediately saw the appeal. The appeal is its flavor: I didn’t anticipate the mellow bitterness, similar to braised endive. Here I used my new cast-iron griddle—I didn’t get crispy charred parts, as one would on an actual grill—but the final texture is pleasant, something like “par wilted,” both succulent and crisp. The rest of the quinoa salad is the one I tend to make a lot, from ingredients I often have on hand. The vinaigrette is a familiar formula, maybe a little heavy on the lemon because it really plays well off the grilled romaine and the fatty avocado. 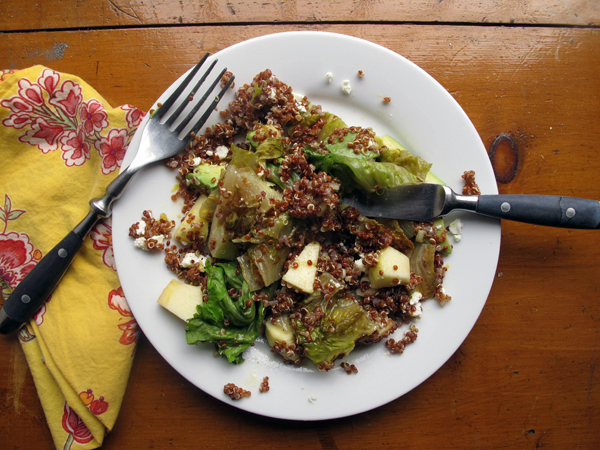 But as for the blueprint recipe aspect: The idea is that you can use the grilled romaine as a base for whatever your favorite grain salad is: farro, barley, rice, or bulgur, even a cold or warm lentil salad would probably be good. 1. Rinse the quinoa and drain it well. Transfer to a small saucepan an place over high heat. Toast the quinoa for a minute or two, just until its grassy aroma is released. Then pour in 1-1/2 cups water. Bring to a boil, then cover and reduce the heat and cook until the water is absorbed and the germ of the quiona is exposed, about 15 minutes. Let stand uncovered until ready to use. 2. Make the vinaigrette: Combine the lemon juice and zest, mustard, salt, pepper, and sugar in a small bowl, then whisk in the oil. Taste and adjust the salt and sugar if necessary. 3. Remove the floppy outer leaves of the romaine and reserve them for another use. Quarter the hearts lengthwise. Place a griddle over medium-high heat then brush it lightly with oil. 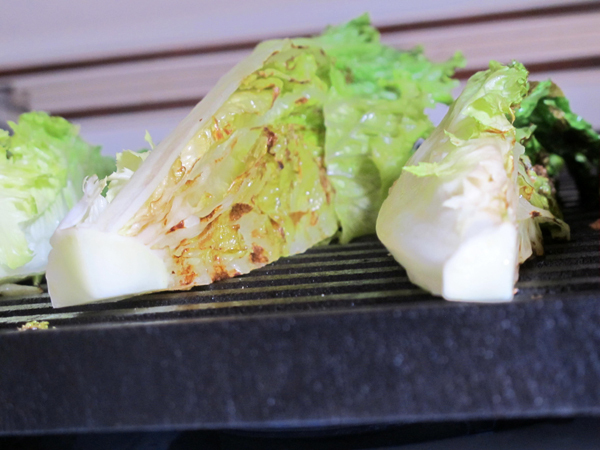 Place the romaine quarters on the griddle, one flat side down, and cook until they develop grill marks, about 3 minutes. Turn the hearts to grill the other flat sides. 4. Combine the cooked quinoa, scallions, avocado, and apple. Dress with the vinaigrette, working in increments, as you may not need all of it. 5. 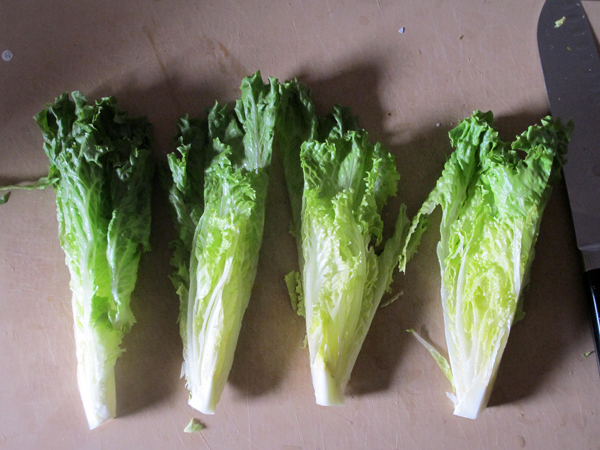 To serve, place 2 romaine quarters on 4 salad plates. 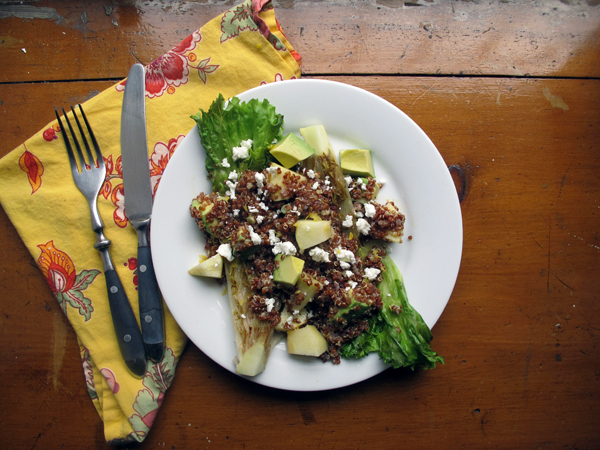 Divide the quinoa over the top, then garnish with the feta, if using. Serve with a fork and a knife.